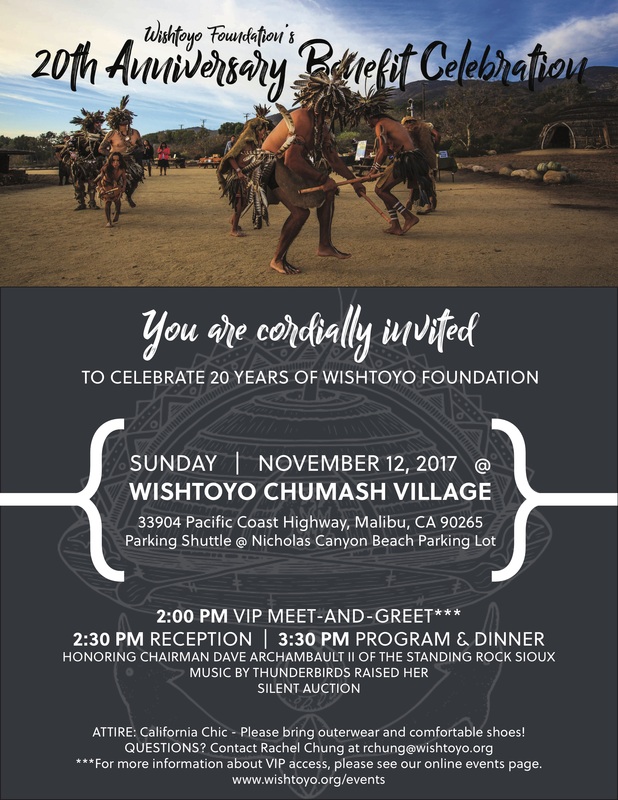 20 years of Wishtoyo... two decades of protecting the environment, preserving Chumash lifeways, educating future generations, and empowering First Nations Peoples on a local and international scale. Thanks to supporters like you, we have made great strides towards building thriving, inclusive communities rooted in a deep connection to our lands and waters. We have much to celebrate this year and we look forward to seeing you at the Village! 3:30pm - Program, dinner, dessert, and awards! Additional guests and honorees TBA! Attire: California Chic - Please bring outerwear and flat, comfortable shoes! Kaqinalin - See you on November 12th! Special Events: The amount of the contribution that is deductible for federal income tax purposes is limited to the excess of any money contributed by the donor over the good faith estimate of the fair market value of goods or services provided by Wishtoyo. Official written disclosure statements will be distributed with acknowledgement letters after the event.